What do the Paddle Pop, the Cornetto and the Golden Gaytime share in common, other than the fact they are all ice cream and delicious? It's a question I would have been stumped by a few months ago. The answer? These products are all sold by the Streets Ice Cream company. I became interested in the two main Australian ice-cream producers (Peters and Streets) after starting a project on the history of the local dairy industry. I wanted to know if there may have been any factories local to the Illawarra, but what I found out was so much more significant. 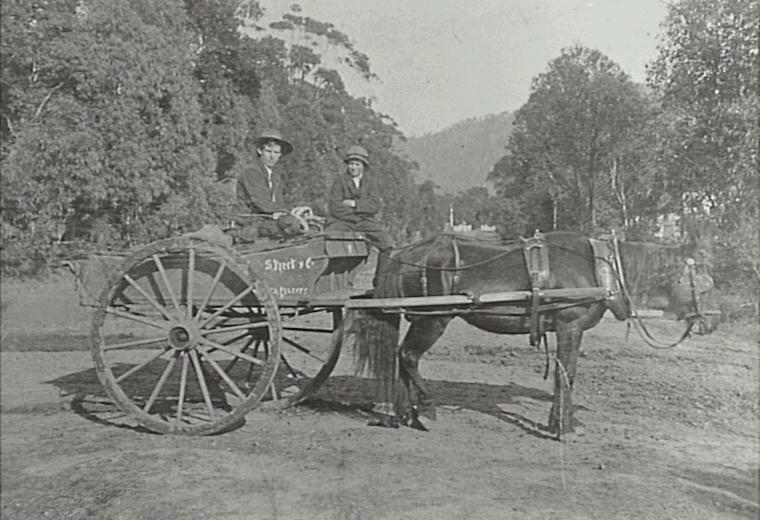 The first ever ice creams under the company name of Streets were in fact sold in Corrimal, N.S.W. 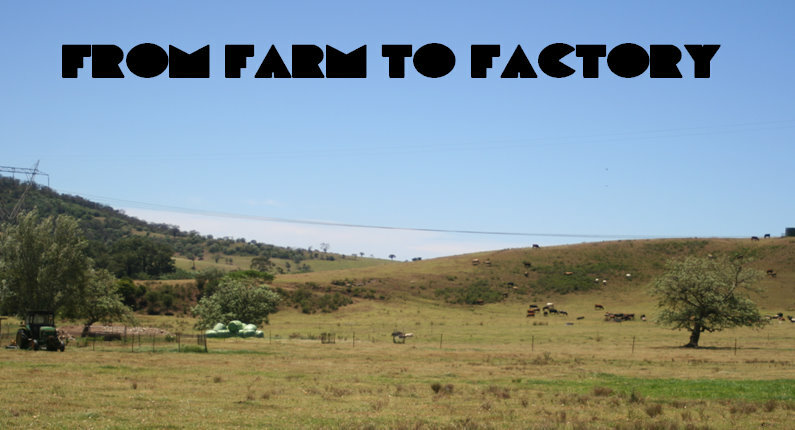 [located north of Wollongong City]. To sweeten the deal, the company's creator had been a local. The history of the company reveals a humble beginning. It was first established in 1920 in the small suburb of Corrimal. The first Street ice creams were sold by Edwin (Ted) Street [left], the company's namesake, and his wife who together owned a fruit shop. The first customer was a Corrimal native, Mr. Pop Winks. Before owning the fruit shop, Ted Streets had sold buttons, needles and cotton in the area. The ice-cream was prepared with a small churn attached to a motor, and after the Depression Streets began selling them in his milk bar. The ice-cream was popular amongst locals and soon enough other businesses in the region began stocking the ice creams. In 1932 Streets most popular ice-cream was known as the ‘Penny Pinky’. It was a strawberry ice cream offered in a cone which sold at the time for a penny. The Peters Ice Cream company was a long-standing competitor of the company, particularly in the Sydney market. The history of individual products of the Streets brand is interesting, with the first of its stick line, the "heart" dating back to 1947. 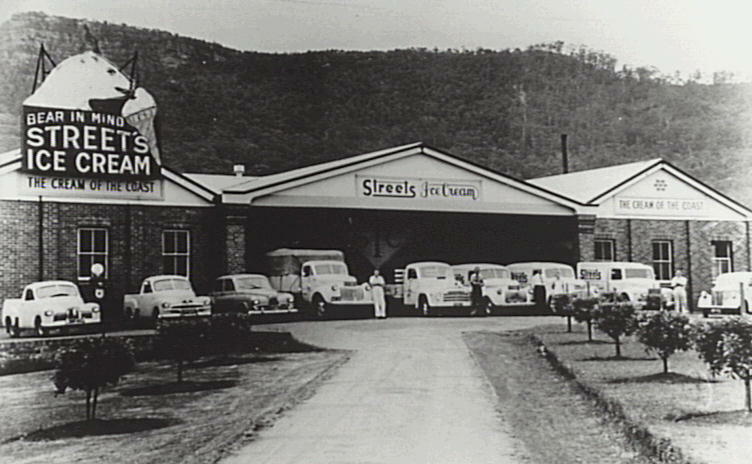 In 1950 the paddle pop was developed, and in this year a second factory was opened in River Street, Moruya. The factory would ultimately have only a brief history, having been closed in April 1954 when the collapse of a local bridge cut the factory off from its main suppliers [the Tuross bridge]. The paddle pop line was followed in 1962 by the "Splice" and then in 1963 the "Gaytime". Though like the Bubble O'Bill these products were developed after the sale of the company to Unilever in 1960, the ice creams continue to be sold under the company name "Streets". The works located in Corrimal boasts the first moving neon sign displayed in Wollongong. It was an iconic sign which featured a polar bear licking an ice cream with the slogan "Bear in mind Streets Ice Cream" [left]. The factory sat vacant for many years until it was demolished to make way for the Illawarra Retirement Village opened in April 1994. In his later years Mr. Edwin Streets was awarded an OBE but not wanting to be called Sir Ted politely declined the offer. He passed away at the age of 85 in 1975. [Right] The boulevard of local stars- located at the entrance of the IPAC; the back of Wollongong Town Hall in shot. 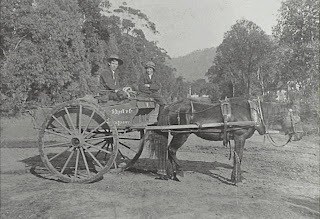 The first image was taken at the Illawarra Museum located at 11 Market Street, Wollongong. The image depicts a Streets sign hung in Corrimal. The museum has a large collection of items related to the dairy industry, including a horse-drawn farm cart and large cheese press. The museum also has collections of war propaganda, a blacksmiths workshop, stockman's hut and a historic schoolroom. The museum has an interesting history of its own, being used as a post and telegraph office dating back to 1882. My father's 1st job with Streets in Corrimal. I actually lived there, and was there at the time the paddlepop was introduced. As a kid, the bear licking the Icecream has always stuck in my mind. I Lived in the Illawarra district until 1966. My mate and I often laugh, we see the logo all over Europe. He was from Wollongong, but now lives in Amsterdam, where I often stay. He keeps bragging that the company is Dutch. He is right of course. I feel that Streets should return to the animation of a bear licking an Icecream...It was on the sign. A rebirth. It appeals to kids. With the animation software you get today it would be unreal. As a graphic Artist, I would like to submit some ideas. Just for fun. No charge!~!.... I still remember the bear back in 1953. Bundaberg Rum have been using the bear with great results. My mate and I mentioned that they were not the 1st to use the Polar Bear. They weren't impressed. The Heart Logo is the best. i believe it was designed in UK. I like it. I reckon there are kids out there that would love to submit designs. I received a lot of information from the Wollongong Library.